Freshman Khani Glover iced the game with his first rushing touchdown. Madison, NJ ….. An offensive surge in the fourth quarter propelled The College of New Jersey football team to a 17-13 victory over FDU-Florham in Madison, NJ on Friday night. The Lions (1-1) leaned heavily on their defense to allow time for the offense get on track and produce a pair of fourth-quarter touchdowns to secure the win. Down 7-3 entering the final period, sophomore Frank Fuccello (Trenton, NJ/Trenton Catholic) and freshman Khani Glover (Jackson, NJ/Jackson Memorial) each rushed for TD scores to lift TCNJ to a crucial triump. The late-game victory gives TCNJ positive momentum as they enter a week of practice before lining up against top-ranked and defending national champion Wisconsin-Whitewater next Saturday in Lions Stadium. The Devils (0-1) put up a fight as they scored a touchdown with 1:59 remaining, but careless play eliminated any hope of last-minute heroics. After forcing the Lions to punt after three downs on the ensuing possession, FDU was penalized for roughing the kicker for a second time in the game. Overall, they were flagged for 123 yards on 12 penalties. While TCNJ's offense came through with its back to the wall, the defense was exceptional in suffocating an up-tempo, no-huddle offense employed by the host. After FDU posted a 7-0 lead early on, the defensive unit held the Devils scoreless for over 50 minutes of play. TCNJ took the FDU ground attack out of the equation, permitting just five rushing yards on 19 attempts for the entire game. The Devils jumped out to a 7-0 lead midway through the opening period. It was an impressive drive engineered by junior quarterback Tyler Maurer (West Milford, NJ/West Milford), as he led FDU 87 yards on 17 plays. He completed his first 11 passes of the game, including a critical 17-yard gain on 4th-and-12 from the Lions' 27-yard line. Two plays later, Maurer hit freshman wide receiver Malik Pressley (Sayreville, NJ/Sayreville) in the end zone from nine yards out for a combination first collegiate touchdown pass and reception on the scoring play. Following the touchdown drive, however, the Devils struggled mightily and showed signs of rust in their season opener. They turned the ball over twice, gave the ball back to TCNJ by roughing the punter and were flagged eight times for 68 yards. The Lions capitalized on the second turnover after junior Zack Vasilenko (Spring Lake Heights, NJ/Manasquan) intercepted a pass at the FDU 35 and returned it 14 yards. Seven plays later, sophomore Colin Cazzetta (Slate Hill, NY/Minisink Valley) knocked a 27-yard field goal attempt through the uprights to cut the deficit to 7-3 with 6:51 remaining in the half. Both offensive units struggled to find their rhythm on ensuing drives and neither would put points up as FDU held its 7-3 lead into the break. With under seven minutes remaining in the third period, quarterback Michael Marchesano (New Providence, NJ/New Providence) put together his best drive to that point in the game. Following a pair of first downs, the sophomore play-caller kept it on a 4th-and-1 at midfield and pushed his way to another first down in Devil territory. Marchesano then connected with sophomore wideout Jeff Mattonelli (Hamilton, NJ/Steinert) for a 17-yard gain and then found junior Andrew Lachawiec (Belford, NJ/Middletown North) for a 23-yard pass reception. FDU's defense responded to stall the drive with a sack and later force a turnover on downs. At the start of the final quarter, the Lions' defense kept FDU in their own territory and forced a punt. A botched snap led to a 21-yard loss and TCNJ suddenly had the ball at the Devil 19-yard line. Four plays later, Fuccello took the hand-off and raced into the end zone for his first career touchdown. A Cazzetta extra point gave the Lions a 10-7 lead with 10:32 to play. Devil sophomore Trey Smith (Long Branch, NJ/Long Branch) returned the kickoff 26 yards, but the Lions were also flagged for unsportsmanlike conduct. That placed the ball at the TCNJ 31. The defense came up big once again as Maurer threw an incomplete pass on 4th-and-11 from the TCNJ 32. From there, Glover showcased his fresh legs to a weary FDU defense. He compiled 45 yards on six carries during the drive, finishing it off with a 2-yard scamper for his first collegiate touchdown. A late FDU score made it interesting, but the Lions held on for their first victory of the 2014 season. Marchesano completed 21 passes for 174 yards in the game. Mattonelli led all receivers with eight catches for 48 yards. Juniors Nick Craig(Howell, NJ/Howell) and Conor Mulholland(North Wall, NJ/Wall) each had three receptions. On the defensive side, senior Matthew Fleck (East Rutherford, NJ/Becton) and junior linebacker Sean Kley (Pennington, NJ/Hopewell Valley) led the way with seven tackles. Seniors Abayomi Arowolo (Jersey City, NJ/West Orange) and Jake Weiss (Flanders, NJ/Mt. Olive) were each credited with a sack. 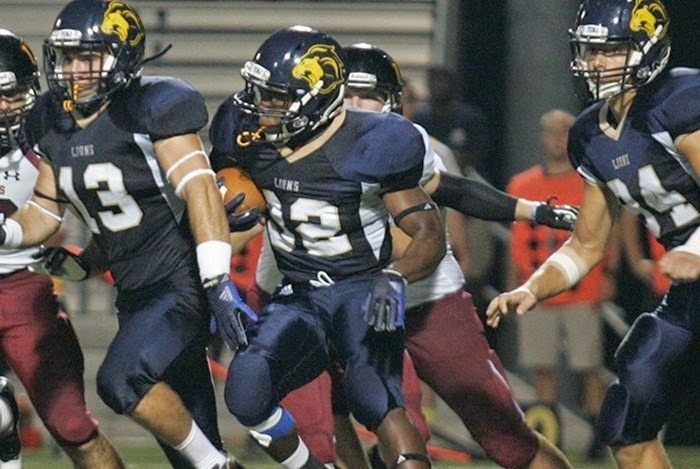 TCNJ will square off against the Warhawks next Saturday in Lions Stadium. The game is scheduled to start at 2 p.m.